What I love about innovation--the power of an idea--is it can come from anywhere. It's not dependent on what you've done before, your talents or bank account size. In fact, too much of any of these things can actually inhibit the process. That's why I'm a huge cheerleader for the little guys. Large established organizations are frequently boxed in [perhaps self-contained?] by this type of thinking. There's too much at risk to try something new. The stakes might be too high with much to potentially lose. The early days of Southwest Airlines was a brilliant example of challenging the status quo. They refused to hire industry professionals who knew how it was "supposed" to be done. They were masters at asking, "What if". "What if we standardize our planes to make servicing them easier? What if we could turn them around in 10 mins instead of 40? What if we focused regionally? What if the flight attendants had fun with the passengers?" Little guys are nimble enough to shift gears if something isn't working. They're forced to get creative when solving problems because throwing more money or people at it isn't an option. They cast vision and create passionate tribes that are crazy enough to realize they just might be able to make a difference. This is one of the reasons why I love church planters so much. They're entrepreneurs. Underdogs. Ministry MacGyvers, if you will. The challenge is to maintain this mindset as the organization begins to mature. Marketplace companies have R&D labs; what about the Church? This is something we need to be intentional about because it's inevitable. Once we discover something that works, we systematize it. So what are we doing to overcome the Factory mindset that is inherent with larger organizations? "The lack of enthusiasm was even evident from the demeanor in the break room; instead of discussing the latest technologies and wildly daydreaming about it’s implications on our field, folks sat around passively drinking their coffee and checking the clock to see how much time remained before they could escape their fluorescent prisons." How many churches does this describe today? My take away from this section is that innovation is born out of initiative, which leads to increased leverage and a following. Factories can be the unfortunate byproduct of success that cripples future growth if not handled with care. True, efficiencies can be fantastic but at what cost? Dawn >> What led to the book’s title? I understand Hurum was carving pomegranates AND lilies for King Solomon’s temple… why not 200 Lilies? [which is much easier to spell, btw] Were there any other titles you were thinking about when you first started working on the book & how did you land on this one? Shawn >> Man, I wish we would have talked before now…is 200lilies.com available! Actually the book is birthed out of a message that took me about 15 years to deliver and was originally named “details, details”. As I worked through the passage even more it become the idea for a book under the working title “The Artist Mandate”. My publishers being a very smart group of people pushed me to be a little more creative - and boy did they get what they asked for when I sent them “200 Pomegranates and an Audience of One”. I also hope to win a spot in the world record books for the longest title in the history of books. Dawn >> In the book, I loved how you made the case that everyone is actually an artist but we all have different canvases which we work on. I also love your point that the most tedious, difficult & usually hardest work [that no one but God sees] is oftentimes the work that matters most. What was the hardest part for you when writing this book? Do you have a favorite part? Shawn >> My favorite parts were the stories. I really don’t think of myself as an author, though I know that officially I am. In my mind Authors write original ideas. I am not sure that I have original ideas as much as I have a story to tell about how Jesus has entered into my life, saved me and now is radically changing me day-after-day. My hope would be that people would find themselves resonating with my story and in the end seeing that the one commonality to all stories with a good ending is Jesus. Dawn >> Some may say pomegranates [the fruit] have a bad branding rap... lots of misperceptions that they’re time consuming & difficult to eat. But I understand you intentionally wrote this book to be a fairly quick & easy read. Is this to overcome any potential baggage of a misunderstood fruit? 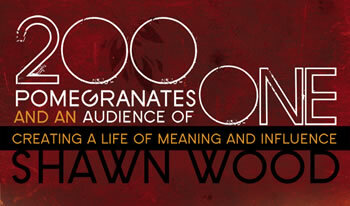 Shawn >> Being a misunderstood fruit myself, I had empathy with the pomegranate. The book is just a little about Pomegranates and more about a life of meaning an influence. But the common truth is that living a life of influence is time consuming a little messy and hard to swallow. But in the end their both pretty sweet! Shawn >> One of the coolest things for me in writing this book, having it published and now waiting for the release date, has been the help of my friends. This blog tour, speaking opportunities, endorsements etc. has just all humbled me and blown me away. One friend in Ministry for me is Keith Baldwin at AspireOne (I think you may know him :)). I asked Keith about some help on setting up a website for the book and not only did he say “yes”, but has made it far better than I would have ever imagined. So yes, it is pretty wicked! Dawn >> If any one else wants to host a blog stop or get their hands on a copy of the book when it releases, where can we turn for help? Shawn >> The book will be sold wherever fine books are sold (Amazon, Barnes and Noble, Your local Christian Book store, from my Mom’s garage) and will be out September 1st 2008. I am planning a Amazon Book Bomb for that day and hope to see my little book as the number one book in all the land for about 3 seconds when my whole family buys one! Also I will be releasing the book and they will be available at Innovate 08 where I will be speaking with some of my friends from Granger Community Church. Dawn >> Thanks again, Shawn for the opportunity to participate. I can only imagine how challenging it was to write this book while teaching & running your FT gig at Seacoast. But I’m sure the lives touched as a result will be too many to count. Well done, my friend. 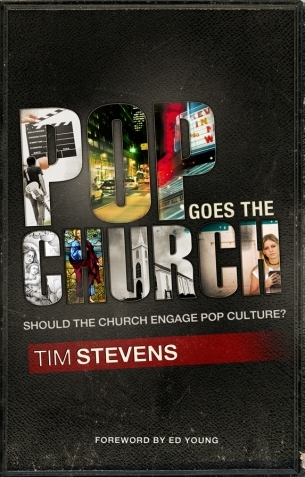 Pop Goes the Church Has Arrived! Thanks, Tim for giving this important topic a voice & explaining what it means for churches today to be intentionally relevant. Milan Ford at Streaming Faith gave me a heads up this morning about an interview he's posting tomorrow with Seth Godin regarding his latest book, Meatball Sundaes & how it applies to ministry. Great stuff. Highly recommend checking it out. Coincidental side note:: I had a call w/Seth myself this morning about the book concept I'm working on, which brought it to another level entirely...very, very stoked about this.